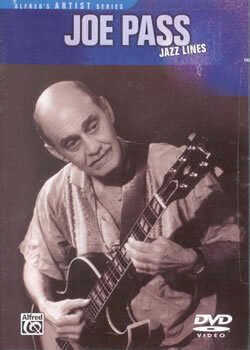 We get a 47 minute long Master Class with the late Mr. Joe Pass himself. I bought this jazz guitar lesson thinking maybe I could learn a thing or three and quickly discovered its above my pay grade and out of my league. I don't feel too bad about that because number one I am not a jazz player and don't really have an ambition to be one. I do want to be a better guitar player however. And two, because I read Joe's interview in Guitar Player or Downbeat Magazine. I forget which but what I came away with was Joe's father wanted him to have a better life than him so forced him into 4 hours a day of guitar lessons and practice. This went on for 5 or 6 years. That's why Joe is so good. Joe got good sure, but later struggled with addiction. Not cigarettes, not alcohol the big H. How fashionable in some circles. How many jazz players get strung out? Too many. So parents lighten up on the forced regimen and keep it fun too in addition to the hard work. Joe also did a nickle inside which is bound to build character give you some good connections on the outside. Fortunately Joe had a skill and a talent. In addition to strong will power to help him still enjoy music and make a life for himself. So, in case you haven't already guessed, this is for serious jazz guitar students who are up to speed with their music theory. Joe opens the lesson and says Hi and gives us an A note. He says he usually tunes with a tuner and then shows us other ways to tune our guitar: harmonics, and the usual tune the 5th string to the 6th string 5th fret. The guitar is tuned in 4ths except between the 3d and 2nd strings where its thirds.